Christmas in the Community – A Big Thank You to All Participants! Our Christmas in the Community campaign was a big success, and I’d like to thank all the bloggers who participated in this project. Their trees are beautiful and well-thought out, and from the looks of things, they enjoyed decorating their tree as much as they enjoyed donating it! I’m so thrilled with the results, and I’m proud to present the first half of bloggers and their decorated trees! White berries, ornaments, twine balls, poinsettias, and ribbons result in a beautiful Christmas tree for the Utah Center for Reproductive Medicine. We decided we’d love to donate our tree to the Utah Center of Reproductive Medicine for several reasons, but the most being that I have been a patient there for many years, and finally this year we were blessed with our two beautiful daughters after a successful IVF cycle. Although it was far from our plan and ideal way to bring our two girls into this world, IVF does have many positive factors, and throughout our journey there were many times when I felt so excited for our visit, I would tell my husband it was like waiting for Christmas morning. Then finally, one day, our ‘Christmas Morning’ came. I received the biggest gift I could have ever wished for. Christmas trees have always felt magical to me. I think it’s twinkly lights! They are a symbol of celebration, a festive notion that something special is about to happen. A child can look at a Christmas tree and silently make a Christmas wish, and it is my hope that our tree sitting in a clinics waiting room will be the receiver of many heartfelt wishes and a gesture of better things to come. For her local emergency women’s and children’s center Sarah’s Hope, Flax and Twine decorated this 7.5′ Fraser Fir with an eclectic mix of Christmas baubles and candy canes dangling from the branches. The result is a beautiful, colorful tree that made all the kids smile. This year, I wanted to take time (beyond my usual toys donation) to give back to the community with a holiday service project. I was trying to brainstorm ideas for a project when a fortunate email came into my in box. There, I found a generous offer from Christmas Tree Market for the donation of a 7.5′ artificial tree to the charity of my choice! Serendipity. With a combination of white, silver, and gold, this beautiful tree cheers up the hallways of the parochial school. Jessica from Mad in Crafts decided to go with a Christ-themed tree with laser-cut wood crosses and chalkboard tags. I believe that Christmas is more than a time to put out sparkly ornaments and eat tasty treats – although I enjoy those parts of the holiday too. Christmas is the season of the church year when we thank God for sending His Son into this sinful world to live a perfect life and die for the sins of the whole world. Christmas is about Christ. When Christmas Tree Market gave me the chance to donate a tree to my son’s parochial school, I wanted the decorations on the tree to reflect that focus. 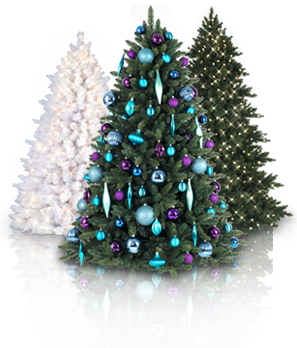 This beautifully decorated tree for Big Cat Rescue features white lights, clear and white ornaments, and other handpicked decorations. Strings of pearls complete the look for this tree. There are few things that spread as much peace, joy and holiday cheer as the sight of a beautifully decorated Christmas tree. But this season, Christmas Tree Market is making the holiday season extra special with their Christmas In The Community Program. As part of this program, Create With Joy was invited to spotlight a charity that’s near and dear to our hearts and to share our experience decorating their 6.5 Foot Unlit Alberta Spruce Evergreen Tree. With its classic red and green theme, Crazy Little Projects brought cheer to the local children’s hospital where her own three-year-old was treated. This whimsical tree now graces the sitting area of the hospital where staff, patients, and parents can enjoy it. Sure there are the gifts and the treats and the giving. But I want you to take the time to look outside your normal routine and find something special that you can do for someone that is outside the norm for you. Something that will make them feel amazing and will make YOU feel amazing. Because if we all do that then we make the world a better place. This week I had the opportunity to decorate a Christmas tree for the local children’s hospital. This is a cause that is near and dear to my heart because my own little 3 year old was in the hospital just a few months ago with meningitis. Christmas Tree Market sent me a beautiful tree and asked me to find a local organization that would enjoy it. Using the home as a theme for her Christmas tree, the Tried and True blog used charming nature and holiday inspired ornaments and DIY house ornaments as decorations. Red berries add a pop of color to the design while white fairy lights brighten up the tree! As I’m sure most of you can imagine, being a blogger can be a very solitary existence. Not necessarily a bad thing (I’m such a homebody!) but since most of my dealings are online, I rarely get to craft out and about in my lovely city. That’s why when Christmas Tree Market contacted me about donating a tree to a local nonprofit, I jumped at the opportunity to give back to my community! Kim Six decorated a chic artificial Christmas tree using gold and silver baubles, silver and gold floral ornaments, and silver snowflakes. She added a ribbon garland and tree topper to top off the entire design. Fun pet toys, plushies, and treats bring a whimsical touch to Christmas Tree Market’s Glitter Pine. She ordinarily receives a lot of pet toys and treats that she donates, but this year, she decided to add our tree to the mix! As I was sorting that pile of products to donate, I got an email from Christmas Tree Market, an artificial tree retailer, asking if I’d like to participate in their 2014 Christmas in the Community campaign. Instead of just dropping toys off at the shelter or rescues, we could make the donation EVEN MORE FESTIVE! So, Christmas Tree Market sent us a glitter-covered tree for the Monroe County Humane Association. John and I picked up a few boxes of LED string lights, bulbs, and a star topper, then we took the ornaments, three bags stuffed full of toys and treats, and the tree over to the MCHA to decorate. A huge Thank You! to these awesome bloggers and their amazing designs! Tune in again next time for the second part of our Christmas in the Community feature! Thank you for the opportunity to participate in this wonderful program!